Recently, I’ve noticed people using the term “dog whistle” before things like racism and classism. Although not the originator of the term, Ian Haney López (Professor of Law, University of California-Berkeley) has recently written a great deal about the concept as it relates to racial politics in the United States in his book Dog Whistle Politics (some of which is excerpted on Salon, here, here, and here). Haney López’s argument goes something like this. As overt or explicit racism has become increasingly seen as distasteful by White voters in the United States, politicians have had to eliminate it from their discourse. However, the potential benefits of appealing to racism have not necessarily subsided especially for a subset of White conservatives. As a result, conservative politicians use “coded” language to avoid explicitly mentioning race while still sending White supremacist messages to a conservative base. As a result, Haney López argues that the racism beneath the surface of these messages goes unnoticed by White liberals and moderates while being quite audible to the conservative base. Hence, the dog whistle metaphor. Reactions to the concept are predictably polarized. To many, especially people of color, the argument simply places a name to a phenomenon that has long been part of how they understand the political discourse of a society where explicit individual racism is avoided but structural racism persists (or is even worsening). To others, especially conservatives, the idea sounds like a crackpot conspiracy theory especially with its references to “coded” language (for example, see criticism of the phrase on RedState). Personally I think the concept has a lot of merit but would perhaps benefit from a more in-depth discussion of language and discourse and how they operate, to supplement the already rich evidence already supplied by Haney López and others. To begin with, it’s important to think about what it means for words to “mean” something. Many of us probably operate with a theory of meaning that goes something like this. Words have isolated and fixed dictionary-like definitions. They mean nothing more and nothing less than these prototypical meanings. We can then combine words together in a mathematical fashion to arrive at a more multifaceted meaning. Hence, adding green to cow results in a reference to an animal that is now understood to be colored green. However, this theory fails to capture other important processes of meaning. First meanings aren’t necessarily fixed. Second, they’re not isolated (i.e., words interact with each other and influence each others’ meanings over time). Third, we never simply experience the isolated dictionary-specified meaning but activate an entire network of ideas when we hear a word. When you see Wall Street written, you likely have a number of associations other than simply a street in New York City. In fact, even though this is what the term refers to on some level, we have come to understand it in other ways: for example, as a reference to finance generally. Indeed, we don’t even need to say finance or banks when we say Wall Street. The phrase itself means finance and banking already by virtue of the associations we have formed between the street and its financial workings, its political power, and also its ethically dubious behavior. While we might have different affective reactions to Wall Street, we still largely share many of the same associations. And so, that’s this tailspin or spiral that we’re looking at in our communities. You know your buddy (conservative scholar) Charles Murray or (public policy professor) Bob Putnam over at Harvard, those guys have written books on this, which is we have got this tailspin of culture in our inner cities, in particular, of men not working and just generations of men not even thinking about working or learning the value and the culture of work; and so there’s a real culture problem here that has to be dealt with. Everybody’s got to get involved. So, this is what we talk about when we talk about civil society. If you’re driving from the suburb to the sports arena downtown by these blighted neighborhoods, you can’t just say: I’m paying my taxes, government’s going to fix that. You need to get involved. You need to get involved yourself – whether through a good mentor program or some religious charity, whatever it is, to make a difference, and that’s how we help resuscitate our culture. The comments sparked quite a bit of controversy. Of particular interest was the statement of US Representative Barbara Lee (Democrat from California), who criticized Ryan’s remarks as “a thinly veiled racial attack” using “code words” to refer to Black people. Haney López himself wrote that Ryan was following in a tradition of “past politicians who have blown the proverbial dog whistle—using surreptitious references to race to garner support from anxious voters”. Ryan responded that his comments had “nothing to do with race” and also that he doesn’t “have a racist bone in [his] body”. There are many ways to suggest that there is a racial element to what Ryan discusses. For example, Paul Krugman points out that Ryan cited the work of Charles Murray, who basically argues for the genetic superiority of White people. However, I believe my own discipline, linguistics, can make a valuable contribution in this discussion by providing evidence of the connection between Ryan’s comments and race that can help to respond thoughtfully to the denial over that connection. Specifically we can use the tools of corpus linguistics to show that there is a network of meanings being referenced in this article that point to clear associations making Ryan’s denial of a racial element to his discourse suspect. I’ve used the spoken (radio and television), newspaper, and magazine sub-sections of the Corpus of Contemporary American English to study the words that are associated with those in Ryan’s comments. I’ve looked specifically at the phrase inner city, since many people pointed to it as a racialized term. You can understand the diagram by noticing first that the center word inner city (red dot) is connected to all of the other words. This is because it was the word I used to select the others. The thickness of the lines connecting the dots indicate the strength of the tendency for the two words to occur together. (Note that the distance between dots is not meaningful.) Thus, inner city and suburbs showed a very strong tendency to occur together, while kids and inner city demonstrated a weaker tendency. In some cases, there are lines between the other words. This means that I found a sufficiently strong tendency for those words to occur together to warrant connecting them (for example, minorities and blacks showed such a tendency). Looking over the strongest associations for inner city, it’s clear that some of them can be called negative without much controversy: crack, violence, and crime, and others connect to controversial issues such as welfare. I believe that this representation can help us to visualize how the concept of dog whistle racism operates. As you can see, explicitly racialized terms, blacks and minorities (both with yellow dots in the diagram), are strongly associated with inner city. They are also associated with the topic that Ryan was discussing more explicitly in the excerpt above, poverty. Specifically both of the overtly racialized terms are connected to the word poor, which is itself connected to poverty (green dots). The strong associations amongst inner city, poor, minorities, and blacks in public discourse suggests that those of us who have listened to radios, watched televisions, or read newspapers or magazines have very likely been exposed to discourse that draws connections between geographic location (inner city), social class (poor), and race (blacks). Thus, regardless of whether we accept or agree with these associations, they are demonstrably connected in public discourse. 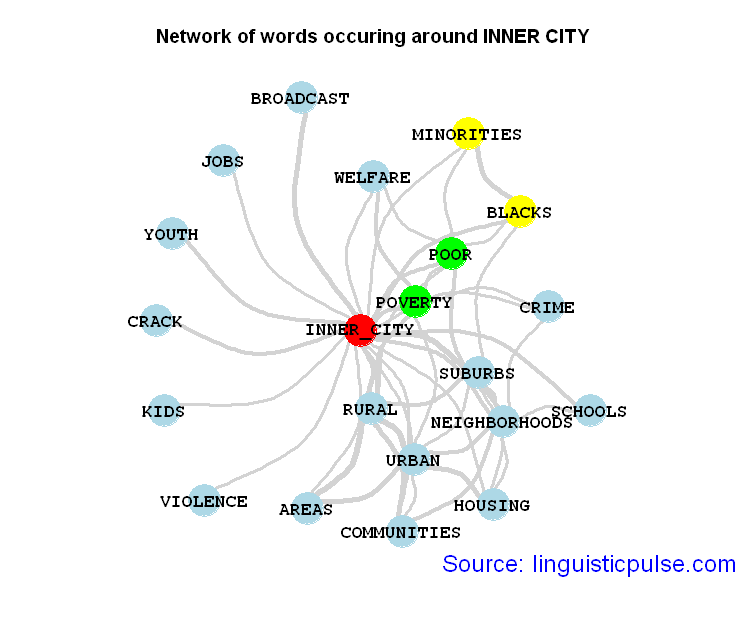 When we hear or read inner city then we not only have the dictionary meanings of inner (more inside of) + city (a large political-geographic region) but also the entire network of meanings we have been previously exposed to. Thus, when we hear or read inner city, we do not simply think of the center of a large densely populated political-geographic region, owing to the public discourse we’ve been exposed to, many of us probably think of things like poverty, crime, violence, and yes Black people. Thus I believe it’s fair to say that Paul Ryan used language he knows has often been connected to, among other things, racial difference in the US. His and his supporters’ continued, fervent denial of these connections then seems disingenuous regardless of whether Ryan was in fact at that moment considering race. However, that Ryan’s discourse is connected to race is not itself the problem. Despite its rather negative connotations, I am not advocating that people stop using inner city. The problem, as I understand it, is the fact that he is suggesting that poverty is a reflection of some kind of cultural deficiency rather than a reflection of systemic socioeconomic disadvantages. Ryan’s avoidance of overtly racialized terms then may be intended to provide a level of deniability for what would otherwise be explicitly racist statements. Imagine, for example, that, instead of “we have got this tailspin of culture in our inner cities”, Ryan had said something like ‘there is this tailspin of black culture’. On the basis of what I’ve observed here, I would suggest that the content of these is only superficially distinct, but the second would likely draw more criticism. There is, however, a degree to which the analysis I’ve done suggests that the phrase “dog whistle racism” is an inappropriate description of how Ryan’s choice of words are probably received by people in general. The metaphor of a dog whistle suggests that the associations between inner city and race are only ‘audible’ to or only noticed by a certain subset of the population (some white conservatives). Haney López has suggested this derives from the fact that white conservatives are exposed to particular types of media (for example, Rush Limbaugh). However, the analysis I have done here suggests that the associations between inner city and more overtly racialized discourse are present in a broad spectrum of media, showing up, among other places, in TIME, CNN, The Atlantic, Rolling Stone, PBS, and even Ebony magazine. This leads me to believe that, rather than going unnoticed by political moderates or liberals, the implicit racial elements of Ryan’s language are in fact noticed on some level by most people. What Ryan gains by using inner city is simply a level of deniability. Whether this is the case for all instances of “dog whistle racism” is unclear. Perhaps, in this case, the level of controversy surrounding these statements reflects the degree to which there are well-known associations between the phrase inner city and race. Nonetheless, I think it’s worth questioning whether politicians’ use of covertly racialized language really is so “coded” and whether it really goes unnoticed by moderate and liberal voters who would react negatively to more overt forms of racism. To generate the graph above, I used the search term inner [city] (brackets ensure that both city and cities are included in the results) in the Corpus of Contemporary American English. I limited my search to the Spoken, Newspaper, and Magazine subsections of the corpus to focus on more public discourse that circulates widely among the general population. I looked at the collocates that occurred in a span of 9 words to the left or to the right (a wide frame to capture a wide variety of possible words) and occurred reasonably frequently in this context, minimally 15 times. This generated a list of words ranked according to their tendency to occur in contexts around inner [city]. Importantly, this tendency is also sensitive to how often the word occurs in a context not near inner [city]. Thus, a highly frequent word like the is unlikely to show up in this ranking, since it is ubiquitous. The statistic used to describe this is called a mutual information (MI) score. I took the top 20 words ranked by MI score, discarding inner, city, and cities (these simply show the phrase is likely to show up with repetitions of itself). These words are the collocates of inner city. I then calculated the MI score between the collocates. In cases where they reached a level of collocation strength as high as the original 20 collocates of inner city (MI < 3.14), I created edges between those words as well. Hi! I found this article really interesting. Would you mind if I reblogged it? I found the following post really interesting. I think it is very important that we use statistics and empirical research, rather than prescriptive theories, dictionaries and grammar books, to explore the true functions and meanings of words and their fluctuation over time. I like to use the concept of ‘inventory’ from Cognitive Grammar and think of this as different individuals mobilizing different mappings available in the inventory. So when you talk about coded racial references, I don’t think corpus evidence is sufficient. All it can do is outline the inventory and show the potential connections available to speakers, hearers and eavesdroppers. I also think you have to take at face value the objections of people who deny explicit coding. Just because their speech can be constructed in one way, it does not mean that they are able to identify the intentions. I’ve addressed this in several papers https://www.academia.edu/7069695/Whos_in_charge_Text_cognition_socialization_and_the_freedom_of_spirit. In fact, the people affected by the racially skewed policies that result from the discourse may be inclined to see hidden codes where the explicit codes are bad enough. So you could even twist the ‘dog whistle’ metaphor and argue that those on the receiving end are more likely to notice the potential for hidden coding than those on the producing end. In the same way that an ESL student may be more attuned to subtleties of English grammar. That does not mean that we cannot dispute or even abhor the politics (if anything I’m probably to the left of most positions you’re likely to put forward). But I don’t believe that labeling them as ‘racist’ or even ‘racialised’ is analytically helpful. At best we can say, they occur in a context where ‘racialised’ interpretations are possible and often made. We can also point out that the people likely to employ such language often advocate policies that tend to disadvantage groups of people in ways that are biased by race, class, gender, sexual orientation, etc. But I’m not sure we need to appeal to the potentially coded language they use. I appreciate your thoughtful comments. I do think it’s important to point out what we can learn by looking at corpus data, and what we can’t. However, with that said, I generally agree with most of what you have to say but I don’t agree with the implication that it contradicts my argument. In particular, you state that people will vary in the meanings they attempt to construct using particular words. This is most certainly the case, and this generalization extends to inner city, meaning that it is indeed within the realm of possibility that someone will utter inner city with an intended meaning divorced from race. It is possible that Paul Ryan did so. However, what my evidence suggests is that, regardless of what Paul Ryan intended at the moment of uttering his statement, the phrase inner city has a strong connection to race in public discourse, which means that people socialized into this discourse, including Ryan himself, will have the possibility of making this connection themselves. It is interesting then that Ryan and his supporters do not even acknowledge the connection in public discourse when they deny that the statement had anything to do with race. Ultimately, the “dog whistle racism” concept especially as described by Haney López suggests an act that is on some level intentional. This is where my analysis’s usefulness ends, and we can only speculate. You state that we need to take people at face value when they deny such ‘coded’ racism. I think this very much depends on what the situation is. Certainly if this were a legal matter, then Ryan should be entitled to have his denial taken at face value by anyone involved in the decision of his guilt. However, if we’re talking about examining or researching the way politicians use language, especially language that might be connected to the highly volatile concept of race in the US, then taking politicians’ statements about their intentions at face value seems neither warranted nor wise. That’s not to say that Ryan did intend this or that; it’s just that being open to the possibility that Ryan is in fact employing code racism is just as important as being open to the possibility that he wasn’t. Ultimately though, I think the bigger point, the point of greater consequence, here isn’t what Ryan intends at all; it’s what Ryan’s choice of words likely communicated to a broad spectrum of people whether that meaning was intentional or not. On this point, I think the corpus analysis provides relevant and strong evidence. I think we’re on the same page when it comes to the specifics. I wasn’t actually at all questioning your conclusions about things like the semantic network around ‘inner city’. I agree with those. My concern with with the implications for the overall discourse analytic enterprise. I agree that the corpus provides evidence of what it is possible for words to mean something and not how any particular meaning will be constructed in any one particular context. I think we can agree that Ryan’s discourse is part of an environment that constructs meanings in a way that policies that end up being racially discriminatory make sense not only as politically acceptable but also as morally correct. We might also agree that they share both a historical and political connection with discourses that are far beyond the pail. But the reason why I want to take their refusal at face value is not because I want to give them a fair hearing. Rather, I am convinced that we need to make this part of our research project. The question being something like: What is the relationship between implicit and explicit construction of linguistic meaning? This is particular important with high-stakes discourse (‘trigger words’, ‘no-homo controversy’, etc.) but my ongoing research suggests that it should be a core concern of semantics in general. You’ve written exactly what I was looking for to use as an explanation for this concept and the key features of its popular usage – hope you’re ok for me to link to this post from my blog? Thank you for your detailed responses to comments as well – you address a few points that are often used as an attempt to discredit this behavior.